Teamwork has been the theme of the past couple of days in Nicaragua. 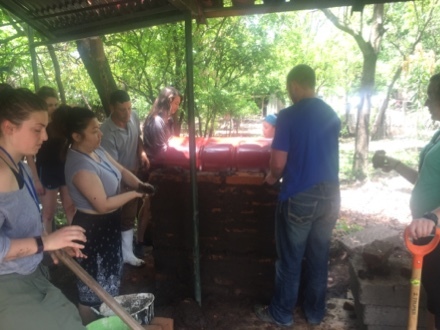 The hard (and dirty) work of assembling ovens made from 55 gallons drums, bricks, and mud has occupied all available hands. Teamwork has been the theme of the past couple of days in Nicaragua. The hard (and dirty) work of assembling ovens made from 55 gallons drums, bricks, and mud has occupied all available hands. After EOS staff prepared the modified barrels with a door and a racks inside, a 15 cm deep rectangular trench is made. A "table" is then built by making a frame of concrete blocks and bricks. These are held together with mud, which is painstakingly mixed to right consistency with (obviously) soil and water. The building continues by making a space for the wood fire below the barrel, placing the barrel in position, and then surrounding the barrel with bricks and mud. Ovens were built at the EOS office, a local house, and a nearby farm. Students helping the community! Everyone also began their "deep dives" into their team projects. 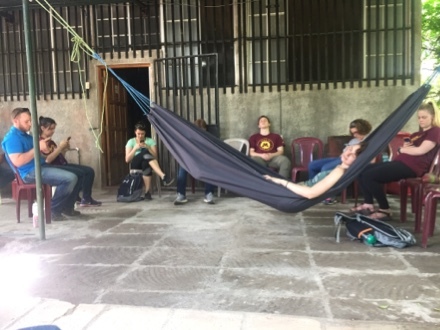 Our teams are looking for uses of waste rice husks, new models for community solar panels for providing energy to isolated villages, and helping enhance the proper usage of water chlorinators...although this isn't exactly what we thought we would be doing. 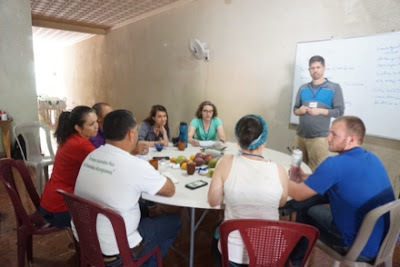 Everyone seemed to have an idea of what their project (biochar/rice, solar, water) would focus on and what the potential solutions were from our discussions back in Minnesota. Talking with EOS staff and beneficiaries quickly showed that adaptation would be necessary. As an instructor, it has been great to see the teams energized by the challenges. Everyone has also seen first hand how talking to those working in the community and potential and actual users/beneficiaries of the technologies is critical in the process. The different perspectives brought by students from different fields has certainly helped each team. Ideas have been free flowing. Solutions will follow.